The needs of almost a quarter-million people in the Philadelphia region never cease to arise, but that could also be said of the generosity of people giving to the annual Catholic Charities Appeal. Now in its 61st year, the largest annual fundraiser of the Archdiocese of Philadelphia in support of the church’s works of mercy launched Tuesday, Jan. 22 at an event hosted by St. Katherine Day School in Wynnewood. While that is only a few minutes’ drive to Chester in Delaware County, it’s a world away in socioeconomic terms. But the compassionate care of last year’s 51,000 donors to the appeal through archdiocesan agencies reaches the city’s poorest residents. Samuel Abu, the volunteer coordinator for archdiocesan Catholic Social Services’ Delaware County Family Services Center in Chester, described the Catholic outreach to people who are living on the edge of homelessness as well as those recently released from prison or drug rehabilitation, to name just some of the 30 clients who visit every day. The center’s breakfast program offers a daily morning meal and coffee, use of a shower and laundry, a place to send and pick up mail — and important intangibles. Father Anthony Orth, pastor of nearby St. Gabriel Parish in Norwood, continues his ministry to pray with the guests before breakfast, and all the staff and volunteers engage them with “healthy conversations,” Abu said. He told how he told one young man, a breakfast program client helping Abu to deliver supplies, described how many bad people he has encountered, but how many good people are present at the Catholic facility. One example of the center’s effectiveness is Abu’s story of how a client had a job interview but his day to take a shower – they are staggered in the week in order to serve more people – was not that day. Nevertheless, he not only was permitted to shower and shave, but a clean change of clothes was obtained for him. And he landed the job, Abu said. 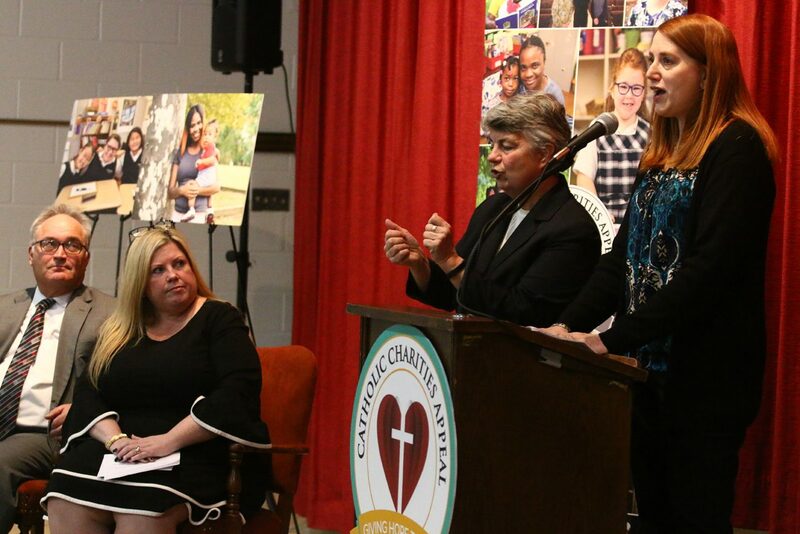 Back at St. Katherine’s, leaders of the Catholic Charities Appeal emphasized the necessity of funds from the appeal, whose goal is set at $12.5 million again this year, to the church’s social outreach. For Catholic Social Services, the appeal “is the foundation for creative partnerships with government as well as standalone programs that would simply not exist without the appeal,” said James Amato, archdiocesan Secretary of Catholic Human Services. — more than 10 million meals served annually through Nutritional Development Services. The examples of ministry show how “the appeal funds blend with other sources to produce efficient, effective, results-driven programs,” he said. He thanked parish pastors for their ongoing encouragement of parishioners to support the appeal, and to the Catholic Foundation of Greater Philadelphia, which administers the appeal independently of archdiocesan finances. Human and spiritual needs arise anywhere, and the schools of special education meet those needs with help from the appeal. 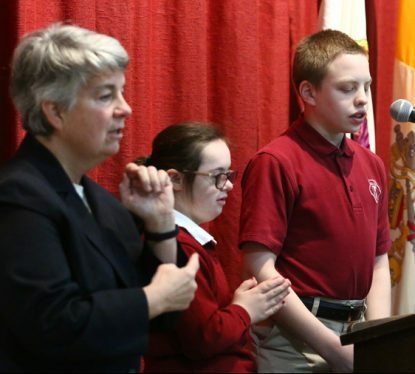 St. Katherine and Our Lady of Confidence Day School serve children with intellectual disabilities, Down syndrome and autism, while children with physical handicaps find a quality Catholic education at Archbishop Ryan School for the Deaf and St. Lucy Day School for Children with Visual Impairments. Ben Wallace is legally blind but he discovered a video of St. Lucy students in uniforms and singing, and it made an impression on him. He attended a public elementary school, although it was not a good fit. The children in the video “sounded happy and he wanted to be happy. He wanted to visit St. Lucy School,” said Ben’s mother Natalie, whose family are members of Visitation B.V.M. Parish in Norristown. Natalie Wallace or her husband make the sacrifice of driving an hour and 15 minutes every day to St. Lucy’s, along with paying the tuition for their older daughter at Pope John Paul II High School and their middle daughter at Visitation B.V.M. School. 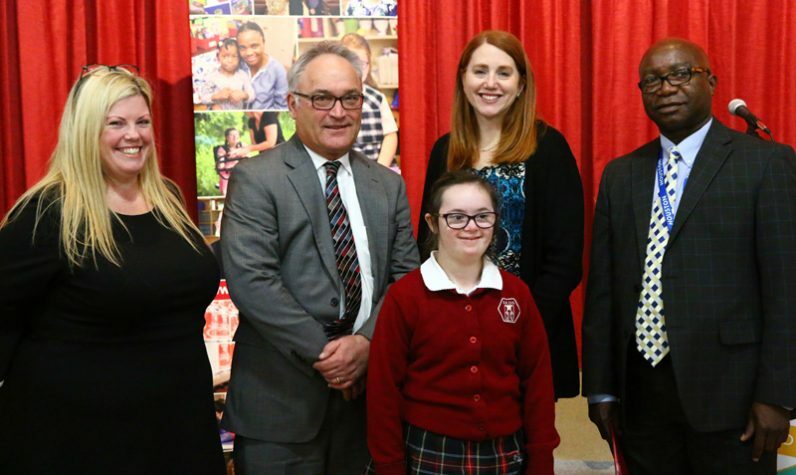 Despite the sacrifices, the family is grateful to the Catholic Charities Appeal’s support of St. Lucy’s and the Catholic character of its special education program. “To know my kids are happy and they know who Jesus is, and have a relationship with him, to feel his presence, is all that I want for them,” Wallace said. 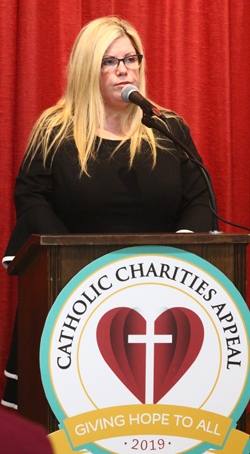 The theme of “Giving Hope to All” means that “when you give to the Catholic Charities Appeal you shine a light of hope, you feed the hungry, you aid the poor and you bring joy to the suffering,” said Linda McDonough, president of the appeal board. Gifts to the appeal may be made through one’s parish or directly here at CatholicCharitiesAppeal.org. Beneficiaries of the appeal, including CatholicPhilly.com, are grouped into five key areas including education, social services, evangelization, parish and spiritual life, clergy and local mission activities. See the full list here. According to the website, up to $10 million of funds from the appeal will be reserved for the traditional beneficiaries including social services, with the remainder supporting other archdiocesan ministries.